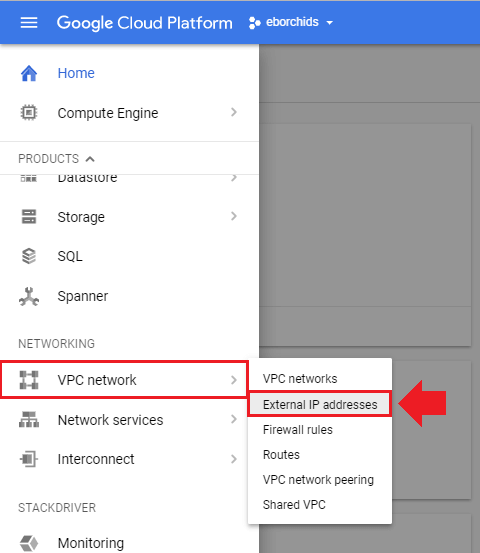 One of the first steps after deploying a website project on Google Cloud Platform is to reserve a static IP address. The majority of technical problems experienced by Google Cloud Platform users occur because the user failed to reserve a static IP address for their website. 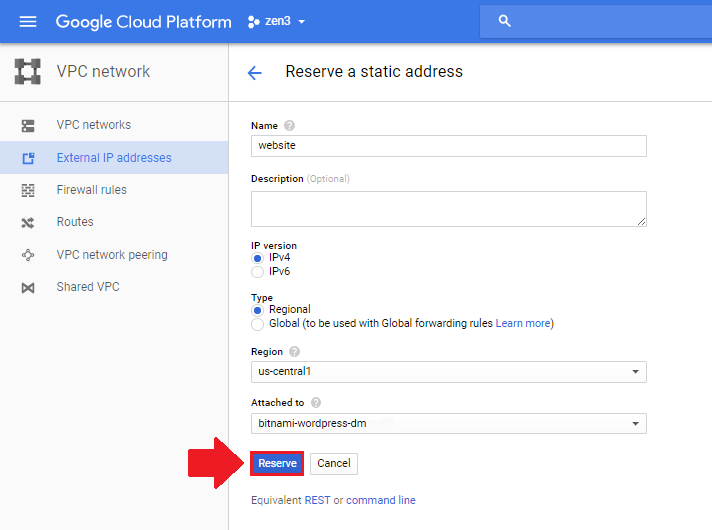 In this tutorial you will learn how to easily reserve a static IP address for your website on Google Cloud Platform. Before starting this tutorial, you should have already deployed a website on Google Cloud Platform Compute Engine. 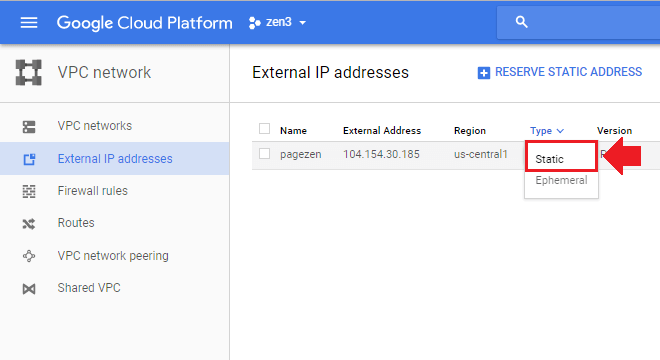 From your Google Cloud Platform dashboard, navigate to Networking > External IP addresses. If you already have a website configured, click the down arrow under the “Type” column and select “Static” for the External IP address that is connected to your instance (Recommended Method). If you would like to reserve a new static IP address for your instance, instead of using the existing one, click the “RESERVE STATIC ADDRESS” button. If you choose this option, make sure the IP address matches the IP address in your website’s DNS records. Configure your settings based on the image above, making sure to attach the static IP address to the correct instance. 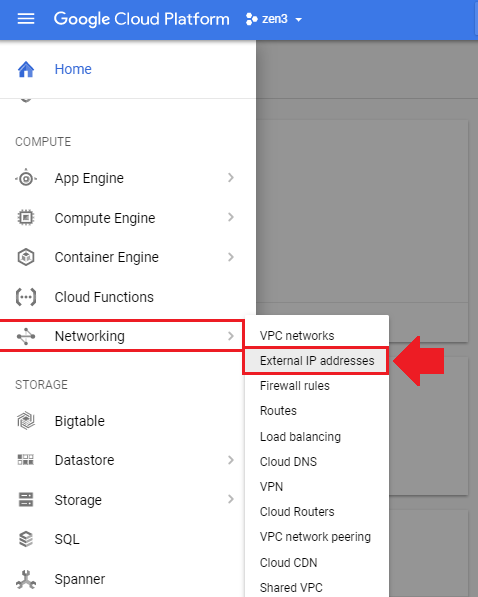 Depending on your Google Cloud configuration, your External IP Addresses may be located either under “VPC Network > External IP addresses” or “Networking > External IP Addresses”. By reserving a Static IP Address, you will prevent your site from breaking after server outages or restarts. Hi ! thank you for all, your tutorial has really helpful. I’m trying to do that but my own don’t working. when i clicking on SSH button nothing happent . What do you mean nothing happens? Do you have a pop-up blocker enabled? Hi OP, thanks for the tutorial, is the static ip cost will be deducted from the 300 credit? Yes – the networking costs will be deducted from the $300 credit. I’ve deployed WordPress via the click and deploy solution. At the begining It was possible to connect the compute engine VM via the IP which appeared in the “Deployment Manager” menu but now I don’t know why it don’t works anymore, my browser is loading everytime. It is true for the IP adresse and also for the IP adress with the “wp-admin” at the end. On the other hand, I can access to the phpmyadmin configuration, and it’s the same IP. Note : I’ve configured a static IP adress. Did you configure a domain name for the website on the VM? If so, over time, the IP will begin to resolve to the domain name. Also, what do you mean by, “At the begining It was possible to connect the compute engine VM via the IP which appeared in the “Deployment Manager” menu but now I don’t know why it don’t works anymore, my browser is loading everytime”? I configured a domain name for the website on the VM at the begining and after I deleted the cloud DNS API because I was thinking that it might be the cause of the issue. So now I’ve got a VM with WordPress click and deploy on it and a static external IP for the VM. When I’ve launched the VM with wordpress on it for the first time, it was possible to go to the wordpress admin panel but now I just cannot. I just can connect to the PHPmyadmin panel. Deleting the Cloud DNS API will break your website configuration. You will have to re-enable it and make sure your DNS A record matches up with the IP of your domain. It sounds to me like there is a DNS issues – either your domains/IP address aren’t matching up, or you have a redirect in your Apache configuration that it causing problems. Hello, thank you for your tuts, they help a lot. But, look, after I rebooted my instance my ephemeral IP has changed. (I was doing your auto back up tut) I reserved this new ephemeral IP as a static IP, What happens now I got the redirect to my old ephemeral IP, which happens even when I create a new VM under another static IP. How I fix that, as it is empty now? This is a problem with your browsers cache and with DNS propagation. Unfortunately, it can sometimes take a day or two for the IP address change to fully take effect. The first workaround is to try visiting your website through a free proxy/VPN and see if your old IP is still loading; this will bypass your browsers cache and give you an idea of which IP address your website is using in real-time. As I mentioned before, this change can take awhile (sometimes a couple of days) – especially if your website had been using the same IP for a long time. Good descriptions, very useful. I did this on 7/1/18 so a little has changed in the layout of the GCP dashboard, but not enough to cause any problems following along with the video. So thanks for the work, saved me a lot of research and time! I do have one suggestion. like to read the feedback, before I do something like this. It would be great to have a button, arrow ect, to send you back to the top of the page. I’m glad you were able to follow along despite the layout changes. I will look into implementing a ‘back-to-top’ button, as I know many users will find this functionality useful. Can you please let how I can reserve IP in Managed group? Or is this correct? Do I need to just reserve on VM Instance rather than concentrating Managed Group IP? When used with a load balancer, instances in your instance group are meant to be dynamic – meaning they spin up (and die off) when certain criteria are met as defined by a health check or an autoscaler policy that you define when you configure the instance group. For this reason, it is not important to have a static IP address on the instance’s themselves, as the global (static) IP address is attached to the load balancer itself, which is required to distribute traffic among the VMs in your instance group. Also – remember that load balancers and managed instance groups are expensive to both maintain (usage fees to Google) and configure (developer fees), so resort to load balancing only when you’re running an application with the profitability and daily traffic to justify the cost. Will do – thanks for the suggestion Addy! Hi thanks for nice tutorials on gcloud and wordpress. i am using bitnami version of wordpress. i assigned static ip address and now i am getting 500 server error. what should i do? Go to your CloudDNS and click on the zone for your domain name. I also experienced the same incident. It took several times to reload so that the page could be accessed. Even sometimes a “page not found” or “page does not respond” warning appears. Can you help find a solution? The first thing that I’d recommend doing is to check your DNS – this is usually the root of these types of errors. Also, make sure that your DNS is configured for the correct instance IP address. There seems to be a change to Google Cloud Platform External IP address steps. I followed your tutorial instructions. When I tried to select “Static” from “Ephemeral”, I was shown an option to “Reserve a new static IP address”. I had to key in a Name in lower case, with no spaces….? Is it possible for static IP address to be lower case letters??? Please see screen grab below. I could not enter the ephemeral external IP address already assigned to my website. I am worried that if I enter a new name, it will effect website functioning later. It doesn’t matter what name you assign to your IP address. In the name field, you are only choosing what to call the static IP address, you are not choosing the static IP address itself. If you are switching an ephemeral IP address to static, then the IP address has already been assigned. Hi, thanks for the great tutorial. I don’t have much experience with gcloud, but needed some suggestions. If I am going to upgrade my server to high memory, can I reserve the IP of the instance and then restart the instance and after that delete the reserved IP. Will this lead to any issues. It won’t causes any issue with the website itself – but it will probably cause some networking issues if the virtual machine running your website was already integrated with that IP address. That being said, I don’t understand what the purpose would be of doing what you described in your question. If you could provide more details about your end-goal, I can offer some additional suggestions! I never ever leave comments in posts but your blog has helped me SO much that I am seriously thankful for all the tutorials you have provided (much better than the ones created by Google even!). Thank you so so so much!!! 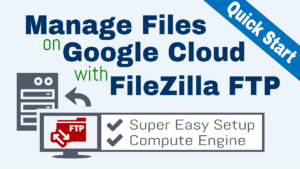 It was straightforward and helped me get on the Google Cloud Platform… also, you should submit some of these to be added to Google’s tutorials, I think they would benefit greatly (and may provide monetary incentives back to you). Thanks again Leron!!! 1. Can you tell me if we are getting 300 dollar. And one year free.. that means 1 year we will not be charged and if if it charges 7 dollar that will be deducted from 300 dollar. Means 7 ×12 equal 84 will be deducted… Is it??? Means first year will be free?? 2. Can we add google ads on wordpress sites.??? You are getting a $300 credit to your Google Cloud account, which will disappear after one year if you do not use the full $300. Certain necessary service charges, such as DNS charges, are not covered under the free tier. 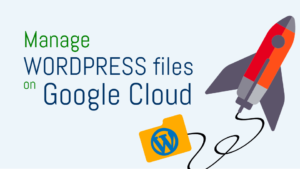 This means that, even though you have the $300 credit, it will still cost your around $1-2 dollar per month to host your WordPress website on Google Cloud. Yes you can add Google ads to your website, but Google will not approve you to use Google Ads (AdSense) unless your website has enough traffic. If you’re just looking for the simplest hosting provider, go with BlueHost. Google Cloud is a very powerful platform for hosting websites, but there is a steep learning curve. In the cost example I used in this tutorial, the cost of using a static IP address was $7 dollars per month for the instance. I am not sure if this is an anomaly or not, but the cost was taken directly from the billing page. For that reason, you could probably expect to incur a similar charge for using a static IP. You should remember, though, that you can typically run your instances without a static IP without incurring any issues – however, if you can’t allow for even the slightest possibility of website downtime, then you should stick to using a static IP address. What is the use of the static IP address? By default, your website is assigned an ephemeral [not permanent] IP address. However, many of your website’s components depend on a static [permanent] IP address in order to function properly. For example, users who do not use a static IP address may notice their website breaking down every time their server restarts. I Don’t generally comment on websites I read But Your tutorial has really helped me move my website under 30 mins. I understand that when an instance restarts it changes the IP address. What if we don’t restart instance at all? Can we live with Ephemeral IP Address for a small WordPress site(10 – 20 visits a day)? or do we ‘have’ to use static IP for WordPress? Great question! You can absolutely live with an ephemeral IP address, and if you are hosting a small WordPress site with 10-20 visits a day, there is really no reason to spend the extra money go to with static. The static option is more important for large WordPress websites, with lots of DNS records and other advanced features that require a permanent IP address.